This entry was posted in Restaurants and tagged Behind, Lunch, Scenes, Talks, UrbanWorks on February 6, 2014 by David. This entry was posted in Restaurants and tagged america, Behind, Desserts, European, Gerhard's, look, Pâtisserie, Scenes on December 22, 2013 by David. Behind the Golden Curtain at Gold Medal Products Co.
Do you know what drives a multi-million-dollar industry? It’s a secret most businesses won’t tell you. It’s simple and honest. It’s the power of you. Gold Medal’s equipment and supply innovations start with the simple goal to taste good and build businesses. It’s the reason why a small, family-owned company in Cincinnati, OH became the global leader of concession products and manufacturing. When your focus is on manufacturing quality machines that last, not only will profits keep popping, but people will take notice. It’s the reason Dan Kroeger, President and CEO of Gold Medal, was recently named a Leading Innovator in Manufacturing. The company and its leadership have also received countless other awards for industry excellence, including the Ohio Governor’s Excellence in Exporting Award and a Doctorate of Foodservice. 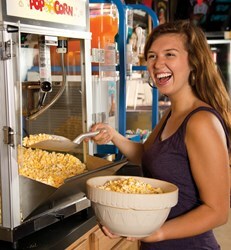 It’s also why Gold Medal has sold over 25,000 concession machines per year for more than 10 years. And continues to re-invest in its community. Gold Medal stands out from the competition thanks to the latest cost-saving, money-making advancements. For decades, its full-time staff of engineers have developed revolutionary innovations—the company holds 24 patents on popcorn machines across more than 80 models of poppers. But it doesn’t just rest on its history. Coming in 2014, Gold Medal will debut a revolutionary fun food advancement that will put a new spin on your concession profits. For more than 80 years, Gold Medal has focused on the fun and good taste, bringing mouth-watering concession classics and scrumptious alternatives to the public. When making any decisions, the motto is, “how will this impact our customers?” If it can’t be answered in a positive manner, then more thought needs to go into the idea. Responding to customers’ desires for new flavors and staying ahead of consumer trends is just one of the reasons why 1 of only the 1,500 worldwide Certified Food Scientists helps Gold Medal create worldwide taste sensations like the groundbreaking Flavacol RS®. People asked for “Heartfelt Popcorn Seasoning,” which prompted the creation of one with 30% less sodium. Focused customer service is also about the people behind the company. As a family-owned business, Gold Medal has always taken great pride in the individuals that work for it and with it. They are the company’s greatest assets and why it’s been recognized as a Best Place to Work. Gold Medal distributors are in neighborhoods around the globe to give reliable, expert advice and keep the power with you. It continues to be a family-run, family-owned company that thrives with the third and fourth generations, each building on the successes of the past. Gold Medal has established 11 additional branches since 1977, and currently employs more than 400 people. Gold Medal debuted its first catalog in 1941. In 1951, Gold Medal already had 35 dealers; the first dealer meeting was in 1957 at Chicago’s Sherman Hotel. Increasing sales required expansion. After moving to its third building in 1960, the company investing in its own equipment manufacturing and expanded its flavor production. The current facility was built in Evendale in May 1997; it’s now more than 450,000-square-feet and has undergone six expansions. For more than 60 years, Gold Medal has distributed concession equipment and supplies internationally. It has a presence in most of the 196 countries, including high-growth areas like China, Russia, Brazil, and Mexico. Now, it accounts for about 40% of total sales and continues to grow around the world. Click to visit Go Behind the Golden Curtain. For more information about this release, please contact Beth Ferguson at (800) 543-0862 ext. 2384 or bferguson(at)gmpopcorn(dot)com. This entry was posted in Restaurants and tagged Behind, Curtain, Gold, Golden, Medal, Products on December 8, 2013 by David. This entry was posted in Restaurants and tagged Austin's, Behind, Spotlight, Sushi, TopRated, Uchi on August 23, 2013 by David. This entry was posted in Restaurants and tagged Apparition, Appears, Behind, Erin, Figure, Ghostly, Mary, Ohio, photo, Virgin on May 26, 2013 by David. This entry was posted in Restaurants and tagged Behind, Chicago, Dance, Dinner, Gratitude, Green, Scenes, USA2 on April 28, 2013 by David. This entry was posted in Restaurants and tagged Behind, Lunch, Perkins, Scenes, Talks on April 13, 2013 by David. This entry was posted in Restaurants and tagged Behind, Chicago, Magic, RitzCarlton, team, Wedding on April 2, 2013 by David. This entry was posted in Restaurants and tagged Behind, City, Lunch, Scenes, Talks, Target on April 1, 2013 by David. Watch Late Nite Reading and BryanStars INVADE Chicago, Illinois on DAY 4 of the BryanStars Tour 2012 Featuring Rocky Loves Emily, Farewell My Love and Catching Your Clouds ** This is PART FOUR of the “Late Nite Reading & BryanStars INVADE the USA” Playlist PART ONE: www.youtube.com PART TWO: www.youtube.com PART THREE: www.youtube.com PART FIVE: www.youtube.com PART SIX: www.youtube.comSubscribe and check back soon for more videos and interviews with Late Nite Reading — BryanStars is a music blogger dedicated to bringing you exclusive interviews and behind the scenes video with your favorite bands and artists For more of my videos, including interviews, music news, song premieres and more, please subscribe to my YouTube Channel www.YouTube.com Check out my official website www.BryanStars.com Follow me on Twitter http Like me on Facebook www.Facebook.com Thumbs Up, Comment and Subscribe!! This entry was posted in Tours and tagged 2012, Behind, BryanStars, Chicago, Interview, INVADE, Late, Nite, Reading, Scenes, Tour on February 26, 2013 by David.